Mt. 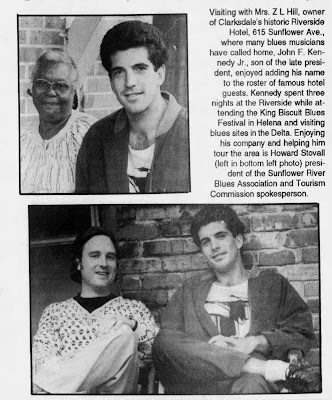 Zion Memorial Fund: “Sexiest Man Alive Spends Weekend in Clarksdale Visiting Blues Sites, Cotton Harvest"
“Sexiest Man Alive Spends Weekend in Clarksdale Visiting Blues Sites, Cotton Harvest"
Ms. Z. L. Hill and JFK Jr.
Clarksdale had a distinguished visitor recently when John F. Kennedy Jr., son of the late U.S. president, stayed here for one entire weekend. Named "The Sexiest Man Alive" by People Magazine, Kennedy is presently working for the district attorney’s office in New York City and was traveling here with a friend from law school, Karen Hefler, a lawyer with the NY firm of Cravath, Swaine and Moore. "Clarksdale is a wonderful place," Kennedy commented to me during his visit. Informed about the local promotion of tourism and the upcoming vote on funds to support a tourism commission, Kennedy said, "I wonder if the people that live here realize how refreshing Clarksdale is to someone visiting from a place like New York." "I think tourism could be a great industry for Clarksdale. I've certainly had fun here." 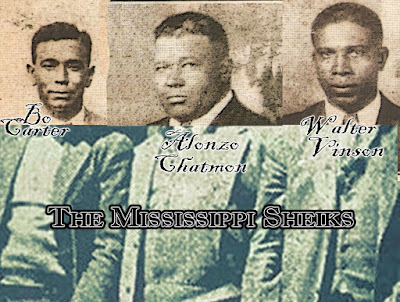 Because of my position as president of the Sunflower River Blues Association and spokesperson for the Tourism Commission, he had been given my name by Rex Miller. Miller is a New York photographer who visited Clarksdale several months ago. "I was constantly amazed at how genuinely warm and friendly the people are," Kennedy continued. "It's a lovely town and a great place to relax and get away from the pressures of New York City." Kennedy and Hefter explained that they had wanted to come south for a blues festival for some time and were steered here by Rex Miller. Suggesting Clarksdale's Sunflower River Blues Festival or Helena's King Biscuit Blues Festival as enjoyable festivals, Miller "insisted that we stay at the Riverside Hotel in Clarksdale because of its blues heritage and because Mrs. Hill is such a nice person," Hefler said. For three nights, the two stayed at the Riverside which is the old G.T. Thomas Afro-American Hospital where the Empress of Blues, Bessie Smith, died following a car crash on Highway 61 in 1937. 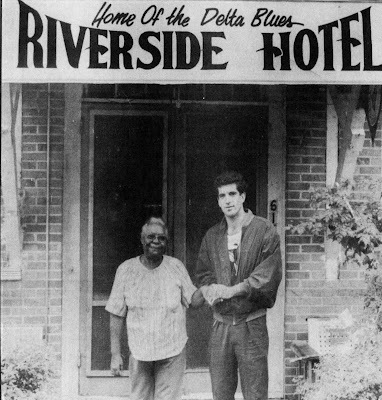 Since Mrs. Hill began operating the Riverside as a hotel and boarding house, it has been home to many famous blues musicians. Although Kennedy had planned to get in touch with me on Monday following the King Biscuit Blues Festival, we ran into each other at the Varsity Club in Helena Saturday night. Inviting them to visit Stovall Farms, I gave them a tour of the area all day Sunday. They were really interested in cotton harvesting. Although the gin wasn't running, we were picking that day, and they got a kick out of seeing the pickers in operation and checking out the bales of cotton on the loading dock. I explained how the crop developed and how it was marketed. When they opened their car trunk later on, I saw they had picked two big cotton plants they were planning to take back to the city. They were pretty embarrassed when I saw the plants, but I got a big kick out of it. On Monday the famous tourists visited the legendary bluesman Son Thomas of Leland and Eugene Powell of Greenville. They were such nice men," Hefler said. "Mr. Powell played for us, and it was some of the most beautiful music I had ever heard." Although Kennedy had to make an early return to New York, Hefler saw more local attractions before she left including a meal at Abe's and an interview at WROX by the Soul Man Early Wright. The two visitors were surprised to learn that the playwright Tennessee Williams had grown up here, and I would have liked running up to Moon Lake to Uncle Henry's and Grant's Pass with a stop at the Friars Point Museum. But we just didn't have time. But before he left, Kennedy said, "We plan to return in August for the Clarksdale blues festival."